Meadow Heights is a suburb of Melbourne, Victoria, Australia, 18 km north of Melbourne's Central Business District. Its local government area is the City of Hume. At the 2016 Census, Meadow Heights had a population of 14,842. Prior to Meadows Heights the area was officially known as Coolaroo. Meadow Heights underwent a property boom in the late 1980s and early 1990s, as demand for new houses rose, forcing prospective buyers into the outer suburban area. Meadow Heights Post Office opened on 6 March 1995. In recent years, developers have focused their efforts on suburbs to the north, with very few new housing projects being completed since 2000. Meadow Heights is bordered by Pascoe Vale Road on the east, parkland on the west, Barry Road on the south and Somerton Road to the north. The area is also served extensively by local taxi companies. Meadow Heights is served by several bus routes. Coolaroo Station and Roxburgh Park Station are the closest railway stations to Meadow Heights. Residents who wish to use train services are advised to leave their cars at home and catch a bus to the station. Meadow Heights offers several places of interest, with the nearest cinema complex located to the south, in Broadmeadows. There are several youth centres for social activities and there is a soccer team in the area. There are around four milk bars; on Bicentennial Crescent and Magnolia Boulevard in the north, Taggerty Crescent in the centre, and one on El Dorado Crescent to the south. The main shopping centre is Centro Meadow Heights, which is located on Paringa Boulevard. It features a SUPA IGA Supermarket and over 25 specialty shops. There is also a mosque in Meadow Heights, near the shopping centre. A community centre and a skate bowl are located in the Buchan Street Reserve. Meadow Heights has parks all throughout the suburb, the most largest of which is the Broadmeadows Valley Park, which starts from Meadow Heights right down to Jacana, with a bike trail alongside. The park has soccer fields and playgrounds near Barry Road and Magnolia Boulevard, providing barbecue and picnic areas for residents. Shankland Wetlands has a variety of introduced and native birds. The wetlands is located south of Meadow Heights, at the end of Barry Road. The most common ancestries in Meadow Heights were 23.2% Turkish, 10.1% Australian, 8.9% English, 6.8% Lebanese and 5.0% Iraqi. 49.6% of people were born in Australia. The most common countries of birth were 12.8% Turkey, 8.8% Iraq, 3.4% Lebanon, 2.9% Vietnam and 1.3% New Zealand. 24.9% of people only spoke English at home. Other languages spoken at home included 26.3% Turkish, 15.5% Arabic, 5.0% Vietnamese, 4.8% Assyrian Neo-Aramaic, 3.5% Chaldean Neo-Aramaic and 1.3% Spanish. The most common responses for religion in Meadow Heights (State Suburbs) were 42.1% Islam, 26.5% Catholic, 6.7% No Religion, 3.6% Anglican and 3.3% Eastern Orthodox. ^ Australian Bureau of Statistics (27 June 2017). "Meadow Heights (State Suburb)". 2016 Census QuickStats. Retrieved 3 July 2017. ^ "541 Broadmeadows Station - Craigieburn North (Mt Ridley Rd)". Public Transport Victoria. 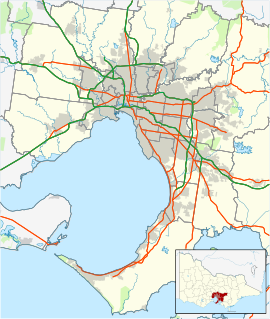 ^ "542 Roxburgh Park - Pascoe Vale via Meadow Heights & Broadmeadows & Glenroy". Public Transport Victoria. ^ "484 Broadmeadows - Roxburgh Park via Greenvale". Public Transport Victoria. ^ "543 Greenvale Gardens - Roxburgh Park via Greenvale Village SC". Public Transport Victoria. ^ "901 Frankston - Melbourne Airport (SMARTBUS Service)". Public Transport Victoria. ^ "953 Night bus: Broadmeadows - Meadow Heights - Roxburgh Park - Craigieburn". Public Transport Victoria. ^ "Meadow Heights Demographics (VIC) Local Stats". Qpzm.